Gatekeeper is a new default feature in OS X Mountain Lion that requires apps be signed with an Apple developer certificate before they can be installed or opened (it can be disabled in System Preferences). 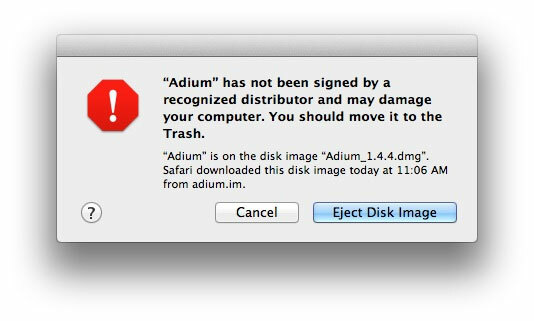 “Adium” has not been signed by a recognized distributor and may damage your computer. You should move it to the Trash. This is a fear mongering dialog. The vast majority of apps people download will not damage their computer, and mere mortals have no idea what "signed by a recognized distributor” means. The word “signed” in relation to security certificates is a very technical term and no one ever calls developers “distributors.” Also, saying “You should move it to the Trash” is weirdly strong wording. I agree with the goals of Gatekeeper, and it’s going to be a great feature for users, but this dialog just feels wrong. It’s very un-Apple-like. Thankfully, it’s in a developer preview. There’s plenty of time for it to improve.